Though very similar to look at to Beogram CD 50, this all new Philips based machine was a radical departure, both in manufacturing and technical terms. The CD 5500 was the first compact disc player to be entirely designed by B&O, and with the exception of the optical deck, it was entirely made by them too. The performance and reliability of the CD X models probably influenced the choice of the Philips radial single beam pickup system and brushless DC spindle motor. Text copyright © Beocentral. Unauthorised reproduction prohibited. 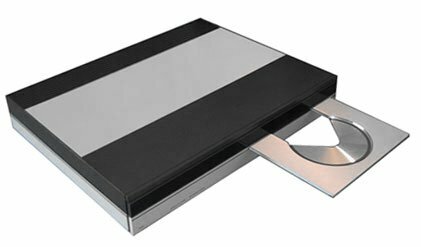 Externally, a slim aluminium plate machined out to the size of a disc replaced the CD 50’s door and drawer loading system, and it moved quickly and silently, again in marked contrast to its predecessor. The deck was on the other side of the fascia, so that the loading of a cassette into the new Beocord 5500 tape recorder, possibly placed below, was not obstructed. Later versions had a concentric 8cm circular recess machined into the loading plate, to accept CD singles. Text copyright © Beocentral. Unauthorised reproduction prohibited. This time, there was no IR sensor option, and the front panel controls were even more basic, so at very least a Beomaster 5500 and Beolink 1000 terminal were needed to use it properly. On the back panel, there was a 7 pin datalink socket for Beomaster 5500, and a single phono digital output connection, for which there was never a use within the B&O range. Text copyright © Beocentral. Unauthorised reproduction prohibited. The performance of this outstanding machine was never bettered, and with the exception of minor styling and software revisions, it remained virtually unchanged until the end of the separates system range with the Beogram CD 7000. Text copyright © Beocentral. Unauthorised reproduction prohibited.